"Ginger Rogers did everything that Fred Astaire did,” so the saying goes, "but she did it backwards and in high heels.” Faith Whittlesey popularized this quotation during the 1980s, and many books attribute the line to her. The message clearly resonated with a generation of American men and women coming to age in the late 20th century, when all things seemed possible. 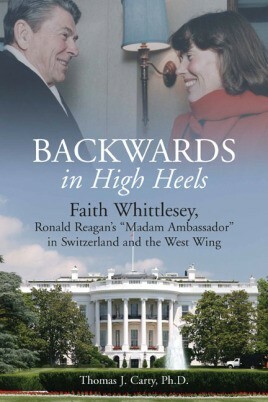 In this book Faith Whittlesey gives concrete meaning to the quotation through her life and career as an effective "Madam Ambassador” in the worlds of both money and politics. Raised in western New York State by highly motivated Irish-American parents of limited means, she worked to reach an eminent position as Ronald Reagan's Ambassador to Switzerland (twice), and to serve as the highest-ranking woman on Reagan's White House staff from 1983-1985. There she occupied the West Wing office soon to be Hillary Clinton's, and as a widow (since 1974) with three children provided a female influence of her own to a presidential culture well before it was fashionable. In addition to her activities in U.S. policy and politics, for more than 30 years Whittlesey has proven to be one of the most important liaisons between the United States and Switzerland, a sister republic as well as financial superpower. Whether operating from her second floor office in the White House's West Wing or the bucolic Ambassador's residence in Bern, Switzerland, Whittlesey made a practice to advocate Reagan's policies through thoughtful debate and persuasive argumentation. After leaving government service, she practiced private-sector diplomacy, serving from 1989 as Chairman and then Emeritus of the American Swiss Foundation, which endeavors to promote understanding between the two nations, organizing several private high-level delegations to visit China, and participating, both publicly and also at times "behind the scenes,” in discussion of the most significant public policy issues of recent decades. This book provides a fascinating look into how one woman, despite daunting obstacles, was able to achieve exceptional influence, thence use her position for the furtherance of common good. Dr. Thomas J. Carty is the Chairman of the Social Sciences Department at Springfield College(Massachusetts) and the author of "Backwards, in High Heels: Faith Whittlesey, Ronald Reagan's 'Madam Ambassador' in Switzerland and the West".